Eric Van Ranst (MSc Geology, MSc Soil Science, PhD Earth Sciences) started his professional career in 1976 as an assistant at the International Training Centre for Post-graduate Soil Scientists at Ghent University (ITC-Ghent). After his PhD in 1981 he was fielded for 9 years in Cameroon under the VLIR -Technical University Cooperation as Lecturer in Soil Science at the ‘Ecole Nationale Supérieure Agronomique’ in Yaoundé, and from 1985 until 1990 as Head of Soil Science Department at Dschang University. In 1991 he rejoined Ghent University as Professor and Director of the Laboratory of Soil Science, and since 2001 as Director of ITC-Ghent. His research activities are mainly focusing on understanding the formation and evolution of soils, their properties, functions and quality based on fieldwork and advanced physico-chemical, micromorphological and mineralogical analyses. EVR: Very difficult question to answer as I do not really have a favorite soil. 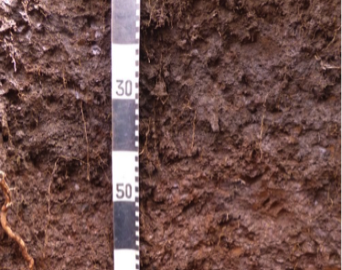 My so-called favorite soils are time-dependent; in the beginning of my career I was especially focused on Luvisols and Cambisols because of my PhD research, and interested in Podzols under the influence of Frans De Coninck, my supervisor at Ghent University at the time. Once fielded in the humid tropics my research interest turned towards variable charge soils (Ferralsols, Andosols, etc.). So if I have to choose a favorite at present, it will be a Nitisol. EVR: Nitisols (IUSS Working Group WRB) are deep, well-drained, dusky red to dark reddish brown tropical soils with diffuse horizon boundaries and a clayey ‘nitic’ subsurface horizon that has typical ‘nutty’, polyhedric, blocky structure elements with shiny ped faces; from Latin nitidus, shiny. Nitisols are strongly weathered materials of intermediate to basic parent rock, possibly rejuvenated by recent admixtures of volcanic ash. Nitisols are far more productive than most other highly weathered tropical soils because of their higher fertility and favorable physical properties (good internal drainage, deep rootability and fair water holding properties). Nitisols correlate with the kandic groups of Alfisols and Ultisols of the USDA Soil Taxonomy. 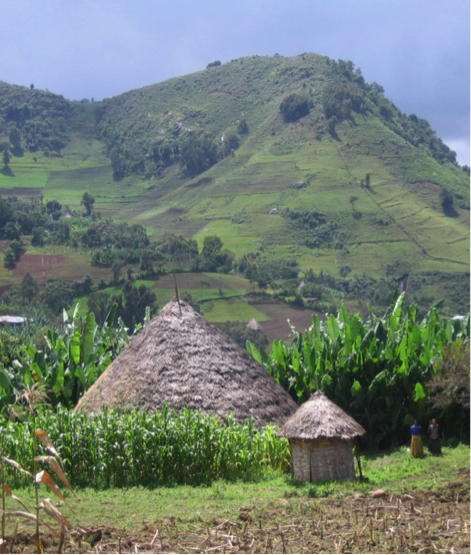 More than half of the approximately 200 million hectares of Nitisols world-wide are found in tropical Africa, notably in the highlands (>1000 m) of Ethiopia, Kenya, the Democratic Republic of Congo and Cameroon. EVR: The shiny faces of the polyhedral, flat-sided or nutty elements typical for the Nito-argillic horizon of Sombroek and Siderius (1982) and for the nitic properties already attracted my attention during field trips in Africa in the eighties because of the animated discussions on their origin by the experts at the time. Over the last 5 years Nitisols became my favorite soil type during soil surveys in a major Nitisol region in Ethiopia in the frame of a VLIR-IUC project. Why? I was surprised to notice that despite their importance for crop production, Nitisols are a soil group whose nature and genesis are not well documented in the international literature. Published analytical data for these soils seems to be very scarce. The exact origin of the typical morphological characteristics of the nitic horizon is still under debate. So in order to fill this gap and to contribute to a better understanding of the development of nitic horizons, we studied selected soil profiles of a Nitisol region in SW Ethiopia in detail by using advanced analytical techniques. 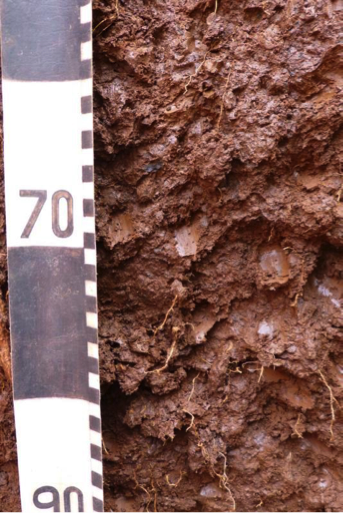 Left: A representative Nitisol profile of SW Ethiopia – Right: Typical structure of a nitic horizon showing structure elements that easily fall apart into characteristic polyhedric nut-shaped peds with shiny surfaces. SSSB: Do the properties of this soil type have consequences for its management, e.g. in terms of land use, soil quality …? EVR: Our recent research in SW Ethiopia (Geoderma 2015, 243-244: 69-79) reveals several features that contribute to understanding the development of nitic horizon properties and its consequences for soil classification, soil quality and land use. Contributing factors to Nitisol development identified are: (i) the presence of open 2/1 clays, besides dominant kaolinite, resulting in relatively high water-dispersible clay content and high swell-shrink potential, (ii) seasonal cycles of wetting and drying, contributing to strong blocky soil structure development, (iii) recurrent conditions of weak temporary hydromorphism resulting in redistribution of Fe-Mn oxides, and (iv) exceptional Fe oxide characteristics, particularly extremely small particle size. Together with the presence of abundant clay coatings, these Fe oxide characteristics explain the shiny aspect of ped faces that is characteristic of nitic horizons. 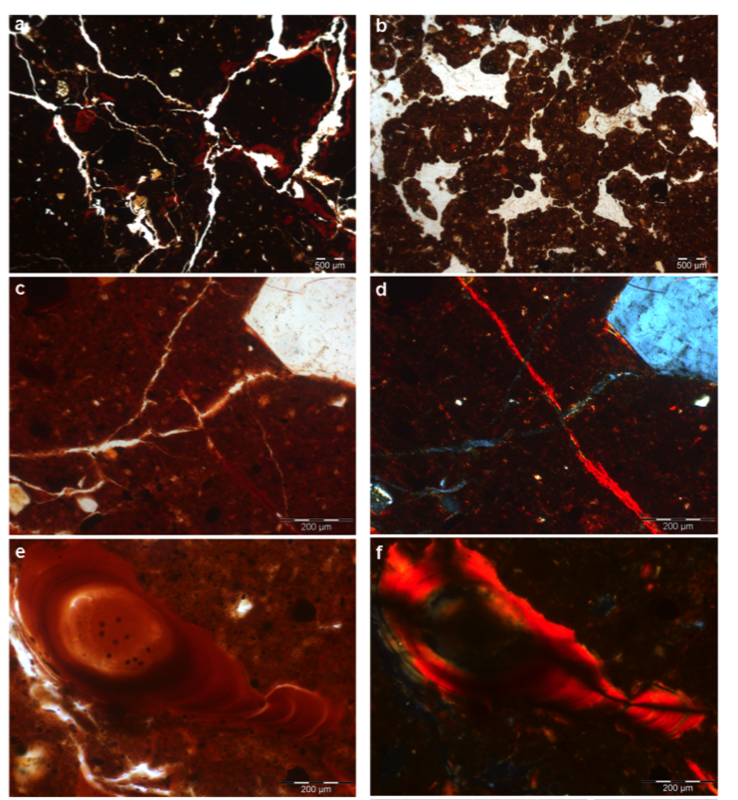 Micromorphological features of nitic horizons: (a) sub-angular blocky microstructure, with abundant illuvial clay surrounding some of the structural units ( PPL); (b) infilling with granular, partly coalescent, aggregates (PPL); (c) blocky microstructure, showing several generations of planar voids, with clay infillings occupying the older pores, and Fe/Mn hypocoatings superimposed on clay coatings (PPL); (d) same as previous, in XPL; (e) micro-laminated coating/infilling of clay with strong parallel alignment (PPL); (f) same as previous, in XPL. 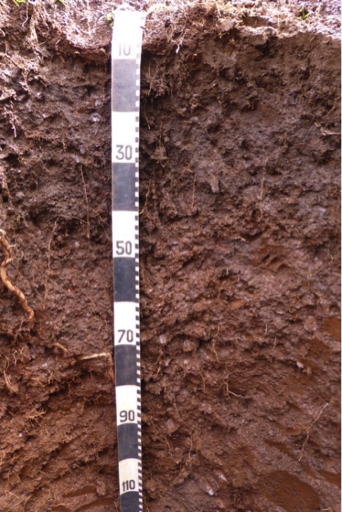 The studied Nitisols are affected by an admixture of surface-derived volcanic ash components, which might be common in Nitisol regions and which puts into question the use of silt/clay ratio as a requirement for this WRB reference soil group. According to the USDA Soil Taxonomy, the studied soils are classified as Oxyaquic Paleudalf. The oxyaquic criteria are assumed to be met in view of the high annual rainfall (ca. 2000 mm y-1) and concentration in a single rainy season. It is also suggested by the common occurrence of landslides during or shortly after periods of heavy rains, triggered by water saturation. The typical nitic properties, the high rainfall, the cultivation of most parts of the land and to a lesser extent steep slopes, make this Nitisol region very sensitive to landslides. Landslides are a significant problem for the local farmers. Therefore, it is important to look for reliable and sustainable measures. Total reforestation with deep-rooted trees can possibly reduce the landslide risk, although this is not a realistic measure due to the shortage of arable land in this highly populated area. Left: A landslide in Nitisols in Ethiopia. Note the tension cracks in the soil beyond the landslide scar. Such features are potential early-warning signs that a possible landslide could be triggered in the near future due to intense rainfall or land clearance – Right: A deforested Nitisol landscape used for arable farming. EVR: My strongest memory related to this soil type is my first field contact with Nitisols (still named Nitosols at that time) in January 1983 during one of the field tours along the slopes of Mount Cameroon. These field tours in the Southwest and Littoral provinces of Cameroon were organized by the Benchmark Soils Project in collaboration with the ‘Institut de la Recherche Agronomique’ (IRA), the Soil Management Support Services (SMSS) and FAO in the frame of the Third International Forum on Soil Taxonomy and Agrotechnology Transfer. I remember very well the first Nitosol profile visited; it was located in the Tole Tea Estate, Saxenhoff Extension, situated on a slope hill at 555 m above sea level; on a fairly old volcanic mudflow and developed in re-deposited pyroclastic materials. This profile was described in December 1980 by the current president of our Society, Bruno Delvaux, FAO expert at the time in the Soil Science Department of IRA at Ekona. At this profile site, I participated for the first time in a discussion on the origin of the ‘irregular, angular, blocky structural elements with common, medium clay skins on shiny ped faces’(as described by Bruno) qualifying the Bt as a Nito-argillic horizon and the soil as Nitosol. During these field trips I became friends with Goro Uehara of the University of Hawaii, who brought me in contact with Gavin Gillman of CSIRO, and both of them were helpful for my further research on Andosols and variable charge soils.